I have been interviewing captains for some time now and I've come to the conclusion that, from both a human and professional point of view, a rigid format is inapplicable in their case. In as much as, captains are men of great experience and responsibility with their own attitude towards their boat, and yacht owner, and its this difference in approach that makes every interview one of a kind. Captain Federico Maggiani, is however in a class of his own for three particular reasons. He is very affable, tremendously secretive and extremely determined. These three factors concocted in one, nearly threw me and while I was asking myself if he weren't the precise type of skipper that everyone that can afford a yacht would dream of employing, I endeavoured to ask my questions cautiously within the boundaries he wished to comment on. He kindly lead me first on a tour of the yacht, the interiors of which are like an inspiring exotic magic world that coupled to the name "Olinda" inevitably makes one dream of South America. Sitting on the deck astern, as I began to listen to his life story at sea, I was inwardly happy, since after all, it was an interesting experience to be subdued by such an authoritative personality. Captain, from what part of our beautiful Italy do you come from and how did you get involved with the sea? I was born in Marina di Carrara and I passed the exams to become a captain of a merchant ship in La Spezia. My family has been deeply interlaced to the sea as from the days of my grandfather. My father during WWII was on board ocean going submarines operating out of the French "BETASAOM" base in Bordeaux, and was awarded a medal for military merit by Adm. Doenitz. I consequently chose my profession out of a natural wish to follow my family's tradition. I started off on sailing boats and without practically realizing it, I soon found myself crowning the dream of becoming a ship's Captain. A job I still do today with great pleasure. What are your first boyhood memories of the sea and of boats in general? I started to go out to sea aboard fishing boats when I was very young, around twelve. Two years later I enrolled in "the sea goers" and in the summer period I went on yachts. In those days pleasure yachting was at its beginning and not the business as we know it today. Just think that at the time there was a sort of code of honour whereby it was considered despicable not to complete the season aboard the same yacht. It was like becoming an apprentice for a job only that in this case the job entailed going out to sea. Only those who knew more about it than you and had more experience were worthy of one's maximum respect and consequently deemed fit to learn from. What was the impact like with the real professional world? A German philosopher, Franz Werfel, used to say that an individual's principal traumas were two: the first was at birth and the second was on starting to work. How right he proved to be in my case. I must admit, that at home, I was always petted and made a fuss of and that on entering the working world, I found myself in a completely different reality to which I wasn't used to. I believe, however, that the effort I put in to overcome the adversities I was faced with, contributed positively to form my character and personality as an adult and ship commander. Which were your first experiences? I grew professionally on ships of the Finmare Group where, luckily enough, I met captains who interpreted their role thoroughly as a true way of being. They imprinted in me their dignity and pride which, in passing years, has become indelible and definitely reinforced. I then moved to the pleasure yachting scenario with huge yachts and well known yacht owners whose names I wish to omit. I do want to mention, however, the shipyards of the vessels I worked on. These are: Baglietto, Admiral, Cantieri di Pisa, Codecasa and Perini, which are all trademarks which have made our shipbuilding industry world famous. At the moment I have the pleasure and honour to command this beautiful "S.Lorenzo" 82' which I consider as being one of the best built crafts to have been produced by the homonymous shipyard. This yacht with its blue hull and custom made interiors, chosen personally with taste and care by the owner, is unique in its kind and in my opinion an absolute gem. Captain how do you spend your free time? On the sea and sea again! In fact I love sailing and competing in regattas, these are mostly local regattas but I'm also collecting some prestigious ones like the "Giraglia," the "Pirelli and Zegna Trophies. Sailing as a sport is incarnated by these competitions which field highly tuned boats with top performance levels. This factor turns a simple regatta in an aggressive race with breathtaking starts and a sense of appeasement and happiness which accompanies us right to the finish line and beyond, as a matter of fact. A shame that the Zegna Trophy will apparently no longer be held, in Portofino. Training School: Nautical Institute of La Spezia. 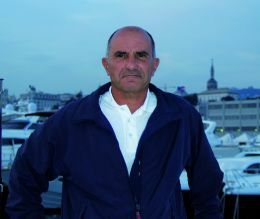 Previous experiences in command: Several yachts of renown shipyards: Baglietto, Perini, Codecasa. The yacht's principal characteristics: Project: V shaped planning hull in fibre glass. L.o.a. 23.95 m. Beam: 6.19 m. Draught: 1.93 m. Displacement: 56 tons. Engines: Caterpillar 2 x 1.600 HP. Max speed: 27 knots, Propellers: 5 blade. Bow and Stern thrusters, 2 x 20 kw electricity generators, 1 Idromar 230 litre/h watermaker, air conditioning system. Fuel tank: 8000 litres. Passengers: max. 16. Engine room with 2 generators for 220v e 24 v. electricity. Interior Design: Ethnical by Architect Sandro Chiavetta. Which innovations in yachting struck you the most and why? Most certainly electronic instruments such as charts and computers have simplified navigating tremendously. The worst experience you ever had as Captain? : A tornado between Japan and the Philippines. How do you regard your role as captain and the world of yachting you work in: Nowadays, a captain is a manager that operates in the vast business of the yachting world.